A stranger arrives in Birmingham City Centre as the biggest festival in its history begins. The events of the next few days will turn the world upside down. 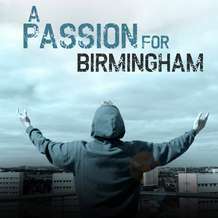 A Passion For Birmingham is a new promenade play retelling the Passion story in modern-day Birmingham. An event for the diocese and beyond, the promenade production will lead its audience around three venues: Birmingham Cathedral and grounds, The Old Joint Stock Pub & Theatre, and the Wellington Pub. In each new location, a new scene unfolds. Tickets are available now from the Old Joint Stock Box Office or on their website www.oldjointstocktheatre.co.uk. Running time: 1hr 15 approx. Please wear suitable footwear. We apologise that due to the nature of the promenade style, the production is unfortunately not wheelchair accessible. Calling all singers! Would you like to be part of the community choir for A Passion For Birmingham? We are looking for a large community choir for a final song at the end of each performance of A Passion For Birmingham. The performance will be a five-minute group performance of a simple modern anthem. Commitment for each performance will be around 45 minutes. We do not need choirmembers to be available for all performances, though they will need to be able to attend one of our choir rehearsals in early April. Please email oldjointstocktheatre@fullers.co.uk if you would like to take part.